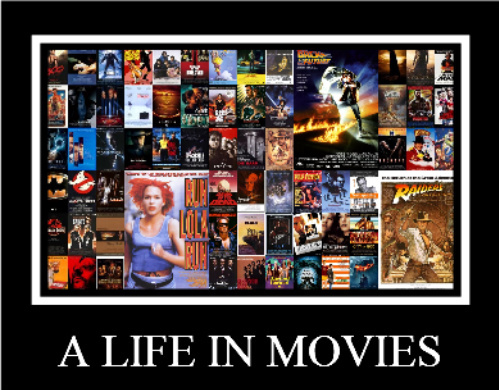 Here is my contribution to Fandango Groover‘s A Life in Movies blog-a-thon, first published in May 2011 and updated since. With the help of IMDb, these are the films I have come up. I’ve chosen them for the simple reason that I enjoy them. 1988 Who Framed Roger Rabbit? This film combines live action and animation to great effect. It produced some brilliant characters, but which is the most notable? Jessica Rabbit, of course. Oh, Indy. You are definitely in my top 5 greatest movie characters. You’re an adventurer, know your history plus you have a great hat. Shame you’re afraid of snakes, though. In my opinion, Pretty Woman is a timeless classic. It’s a fantastic, romantic story and Julia Roberts and Richard Gere have sizzling on-screen chemistry. Okay, so it’s a bit out there – a singer witnesses a mob crime and the police hide her in a convent – but I love it. Whoopi Goldberg shines and Maggie Smith is brilliant as Mother Superior. Well, was I ever going to pick anything else? Jurassic Park is one of my all-time favourites. As explained in my Favourites Friday post and indeed in the film, while there are many reasons why cloning dinosaur DNA is wrong, I do still wish there was a Jurassic Park. Well, as long as life didn’t imitate art! The only Disney film to take a top spot, The Lion King is a beautiful film. As with many Disney films, it deals with some pretty big topics; betrayal, murder, the death of a parent – these aren’t your average themes for a childrens film! The Lion King is a wonderful story and features some highly catchy (and memorable) songs. As I wrote in my Favourites Friday post about it, Toy Story (and the following two) is a wonderful film that appeals to viewers of all ages. It doesn’t matter if you’re 5 or 75, you’ll still enjoy it. It’s an uplifting story about friendship. Good old William Shakespeare. Romeo and Juliet is a story loved by many, myself included, and I think that Baz Luhrmann did a great job with this film. The casting was spot on and visually it looks superb. Are My Best Friend’s Wedding and Pretty Woman classed as romcoms? I guess they are but, to me, they are simply classics. Apart from the lovely Julia, the thing I love most about My Best Friend’s Wedding is the music; it’s basically a homage to Burt Bacharach – wonderful! The Truman Show is a brilliantly simple concept but wonderfully effect. Jim Carrey is great in the title role, and it is definitely one of my all-time favourites. What a strange mix of genres I have chosen for my 1999 films! From romcom to sci-fi, most of the genres are covered. Fight Club is brilliant; highly controversial and definitely a cult classic, it brought Brad Pitt and Edward Norton together to great effect. This was an extremely tough decision to make but, for me, Cast Away just clinched it. Tom Hanks is a fine actor and Cast Away shows him off at his best. It is a brilliant, touching story. Gladiator, though, is an epic and a worthy runner up while X-Men made me want to be an X-Men. Enough said. This is my absolute favourite film. Ever. If you’re a good friend of mine then I’m sure this will come as no suprise. And the prize for best movie battle goes to… The Lord of the Rings: The Two Towers! The battle of Helms Deep is epic. As with all the LOTR films, this film is a feast for the eyes, with Howard Shore’s soundtrack making it a delight for the ears too. I feel like I’m betraying LOTR… But, it is a deserving No 1. I can’t believe it’s been 10 years since it’s release! The Curse of the Black Pearl is no ordinary pirate movie; this is the pirate movie that brought you one of the best movie character’s ever, Captain Jack Sparrow. I saw Crash at the cinema and thought that it was very, very clever. The cast are brilliant – Matt Dillon, Don Cheadle and Thandie Newton shine. It’s certainly a film that keeps you thinking long after the credits finish rolling. Adapted from Frank Miller’s comic, Sin City is seriously cool. While the stories aren’t very pretty, the film certainly is. Seeing 300 on the big screen was a great experience. It’s the kind of film that begs to be seen at the cinema: it’s loud, full of action and the effects are brilliant. Stardust is a wonderful, inventive fairy story. The casting is spot-on and the characters themselves are brilliant – Robert De Niro’s Captain Shakespeare is fabulous, darling. If it weren’t for Heath Ledger’s spectacular Joker, Taken would have taken (pun intended) the top spot. Heath Ledger owns The Dark Knight, giving a memorable and haunting performance that was worthy of his posthumous Oscar. Looking back, 2009 was a great year for film. District 9 just takes the lead but it was against some pretty tough competition. In my opinion, District 9 brings something new to the sci-fi drama, asking a very interesting question: what happens post-invasion when society has to carry on? Technically, The King’s Speech wasn’t released in the UK until January 2011, but it’s getting classed as a 2010 release. I adored this film; Colin Firth and Geoffrey Rush have great chemisty and it is a truly endearing film. 2011 was another great year for film. It brought with it the grand finale of the Harry Potter series and the rebirth of my favourite superheroes, the X-Men. Since its release in September 2011, I’ve lost count of the times I’ve seen my top film, Drive. It is a masterpiece. Bond was back in style, ably supported by his MI6 colleagues and expertly taunted by the mysterious Silva. Daniel Craig slipped back into character seamlessly, with expert direction from Sam Mendes, revealing that Bond was very much back in business. Of the 16 films I saw in 2013, I gave 11 of them four out of five stars, and it is hard to choose my runners up for the year from there. However, there is an overall winner, but only by an extra half a star, Django Unchained. Undeniably Tarantino through and through, Django Unchained boasts a first class cast, a tight script and an intriguing plot. Sadly, only six films were seen at the cinema this year. Happily, though, they were all very strong and it’s difficult for me to choose between them. I’m going to choose Guardians of the Galaxy for the simple reason that I enjoyed it immensely and it will definitely be a film I revisit on a fairly regular basis. The Hobbit: TBOTFA was a suitable conclusion to the trilogy while Gone Girl was one of the best thrillers I have seen for a long time. Dawn of the Planet of the Apes was magnificent; a true masterpiece in combining ‘traditional’ acting and motion capture. Two highly anticipated films were released in 2015 that revisited old favourites. While Jurassic World did hold my attention right from the first scene, my favourite film of 2015 has to be The Force Awakens because it was such an adrenaline rush, returning to a galaxy far, far away in style.